Is Implementing Montessori at Home Overwhelming You? 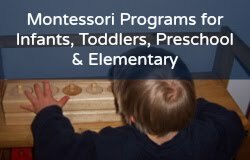 I have been up late and sitting in front of my computer trying to find some cheaper solutions for the Montessori materials and activities I need to buy for my toddler. I feel the subject is sooo big: that it is scary and expensive. I am looking at what these mothers have been doing for their children on their Montessori blogs with total admiration... and a feeling of being overwhelmed. You do not have to spend a lot of money or a lot of time! I don't have much myself (time or money)! But as long as my little guy is happy, and loves learning, that is what really matters! I can't afford a lot of the materials, nor can I spend unlimited time with my son, and I don't feel guilty about it (not any more). I've just accepted it as the way it is. 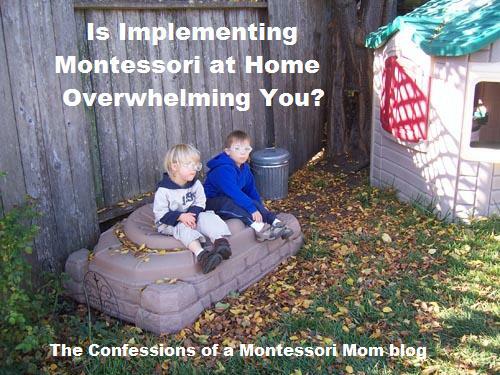 I don't want to you to feel overwhelmed, or pressured to be the perfect mom (I'm not), or have the perfect Montessori home environment (I don't)! And it might help to not look at other Montessori blogs for a while, give yourself a break and instead focus on reading memoir books by other moms, because that is what helped me a lot when my son was born with Down syndrome: reading memoirs (creative non-fiction) by other moms of Down syndrome children, and I stayed away from scary books about "all that could go wrong" with a DS child. Plus, the memoirs by these other moms made my life look so much better in comparison! If you'd like to read some memoirs by other moms who have had struggles, one of my favorites is Operating Instructions: A Journal of My Son's First Year by Anne Lamot. Another book I love is Confessions of a Scary Mommy by Jill Smokler: "An Honest and Irreverent Look at Motherhood: The Good, The Bad, and the Scary." You can see the other books I've read here at Good Reads. You may also be interested in my recommended Montessori and homeschool books for parents and teachers on Amazon.com or my Montessori and homeschool programs for birth to nine-year-olds at Montessori for the Earth.